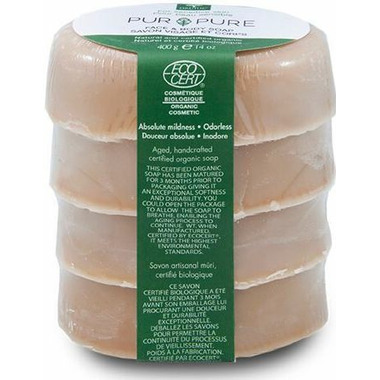 This certified organic soap has been matured for 3 months prior to packaging giving it an exceptional softness and durability. You could open the package to allow the soap to breathe, enabling the aging process to continue. Holistic preparation: Red clover: anti-oxidant (bioflavonoids) and tonic; mango butter: hydrating, protective and nourishing. Neutral and nourishing, ingredients are chosen for their compatibility with even the most sensitive skins. Ingredients: SODIUM PALMATE*, TRIFOLIUM PRATENSE (RED CLOVER) EXTRACT*, SODIUM COCOATE*, OCTYLDODECANOL, MANGIFERA INDICA (MANGO) BUTTER. Sustainable and sensitive. Lasts long as well. Overall, excellent value. Good size to hold; soaps up and lasts well. Best of all it is unscented.